(PhysOrg.com) -- Neutron scattering experiments performed at the Department of Energy's Oak Ridge National Laboratory give strong evidence that, if superconductivity is related to a material's magnetic properties, the same mechanisms are behind both copper-based high-temperature superconductors and the newly discovered iron-based superconductors. So what glues electrons together? Another(?) question: why observed in sun's corona magnetic reconnections "is not well understood: once started, it proceeds many orders of magnitude faster than predicted by standard models"(from wikipedia)? At low temperature (Type I) superconductors it's a spin of electrons. But such force isn't sufficient for high temperature superconductors. The layered structure of cuprates and iron-based superconductors indicates, this force is exerted by surrounding atoms instead. Electrons are attracted to hole stripes (islands of positively charged atoms), which increases their repulsive forces up to level, they become geometrically degenerated. Illustratively speaking, each electron there is surrounded by so many electrons from all possible directions, it literally "doesn't know", where to move first. The forces exerted by surrounding electrons are compensating mutually and as the result, electrons near hole stripes are moving freely through atom lattice. 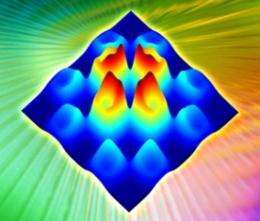 This mechanism is conceptually quite simple, but the large number of electrons involved makes trouble in its quantitative description. But we aren't required to compute thing for being able to use it. Broglia: Thanks for an exceptionally clear explanation! Of course, this explanation basically collides with the meaning of the above article, in which superconductivity is related to a material's magnetic properties. But by Röser's semi-empirical equation, the temperature of supercritical transition depends basically on the geometry only (so called doping distance) with high precision for most superconductors known so far. It basically means, supercritical temperature doesn't care about magnetic properties of neighboring atoms - it just depends on the compression of electron fluid inside of atom lattice. The more sparse the hole stripes are, the better compression level of electrons could be achieved, because electrons are repulsing mutually across layers at distance. On the other hand, the other characteristics of superconductor - like the critical current or intensity of magnetic field, which destroys superconductivity - could still depend on the nature of neighboring atoms. I'm not sure why they are acting as though they just discovered the atoms are held together by magnetic bonding ,It has been shown at this website for almost 6 years.also be sure not to overlook some fundamental unrecognized principles of magnetism & magnetic harmony in regards to what is now known as the "Equilibrius Grid"